A Bait Puppy Just Collapsed On Their Front Porch. They Had To Act Fast To Save His Life! There is something that happens behind the scenes and most people are unaware of it. It is dog fighting, and one of the practices is to put a defenseless animal, such as a puppy, into the ring to test the fighting instincts of the larger animals. They may also be used to train dogs who will be used for fighting as well. This is something that takes place in countries around the world. It is also a practice that happens behind closed doors in America. 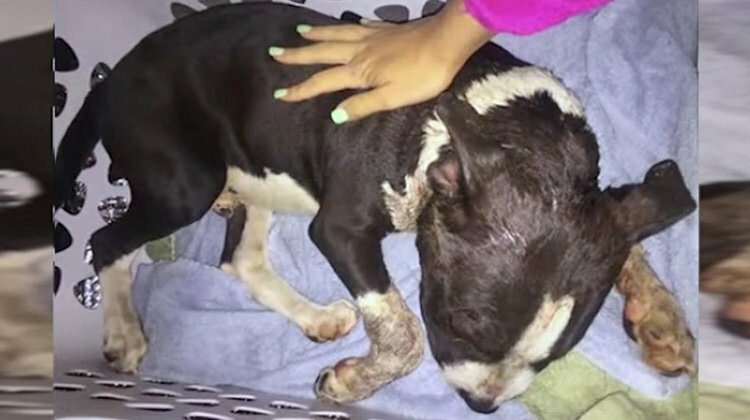 When a five-month-old pit bull puppy came onto a front porch in this neighborhood and collapsed, the owner of the home was shocked to see his condition. He had serious wounds to his neck and head. It was thought that he was used as a bait puppy in a local dog fighting ring. This happened in Topeka, Kansas and the homeowner immediately called a rescue group who came out to save the puppy. He was so beat up and injured that it was difficult to tell he was even a dog! He was practically motionless while waiting for the rescue team to arrive and it was feared he would not live through the ordeal.